The USAT Liberty on the open seas in all its glory. Ever since humankind first learned how to travel by water, the sea has intervened, interrupting voyages with storms and dragging vessels and sailors to the bottom of the ocean. Whether a ship was capsized by a natural disaster, sunk in a battle between two navies, or purposely scuttled to create an artificial reef, shipwrecks provide an added level of excitement and interest to any scuba dive. Seeing a colossal, manmade structure at the bottom of the ocean provokes curiosity, awe and amazement. Hardly ever, though, do we think about the history behind these wrecks. One of the most famous shipwrecks for scuba divers is the USAT Liberty located in northeastern Bali. This is a shipwreck with a history that will fascinate and amaze. It makes for some excellent diving, too. The USAT Liberty was a United States army transport ship launched at the end of World War I. It was completed too late to see any military action in that war but made several journeys across the Atlantic transporting animal and general cargo until being decommissioned in 1919. Between the two World Wars it was involved in commercial shipping. Liberty was recommissioned by the US Army in 1940 for defense service in the lead-up to the US entry into World War II. In January 1942, the Liberty was transporting rubber and railway parts from Australia to the Philippines as part of the allied war effort in the Pacific. Traveling near the Lombok Strait, a torpedo launched from a Japanese submarine, the I-66, struck the Liberty and blew a massive hole in the ship’s hull. Luckily, two allied destroyers patrolling the area came to its aid. 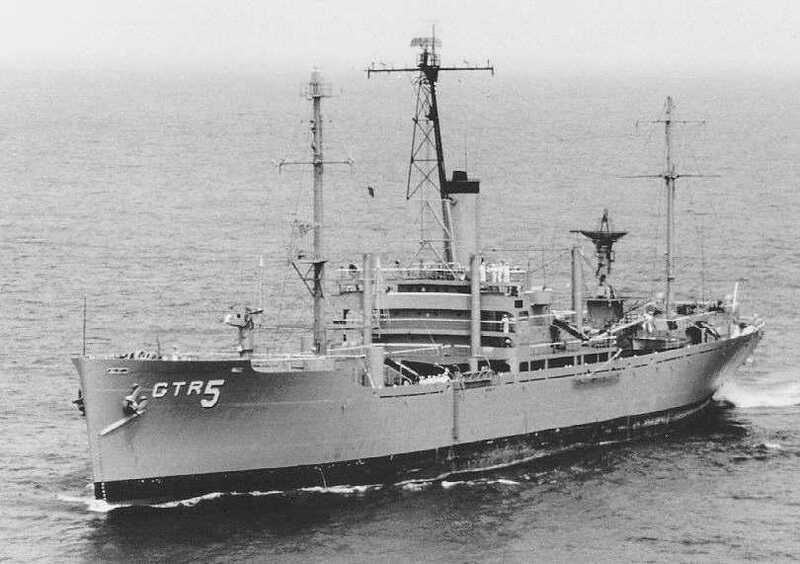 The USS Paul Jones and the Dutch destroyer Van Ghent chased off the Japanese submarine and started to tow the badly damaged Liberty to the Celukan Bawang harbor at Sinaraja, where its cargo could be salvaged. USAT Liberty would never make it to its destination. The torpedo hole caused the ship to take on too much water and it eventually was deliberately run ashore on the beach outside of Tulamben, a sleepy fishing village. For more than 20 years the Liberty sat in plain view on the beach. Locals used it as a fishing platform and as a source of scrap metal, taking everything from pothole lids and doors to glass panes and railings. In February 1963, Mount Agung, an active volcano that dominates the horizon of Bali, erupted, sending thick plumes of smoke cascading into the air, launching rock bombs that rained down on nearby villages, and pouring rivers of lava down the slopes of the volcano. The resulting destruction engulfed entire villages and caused significant damage to human life. Even the USAT Liberty did not survive unscathed. Tremors linked to the eruption caused Liberty to slip off its beachside perch and slide down a sandy slope until it was completely submerged. 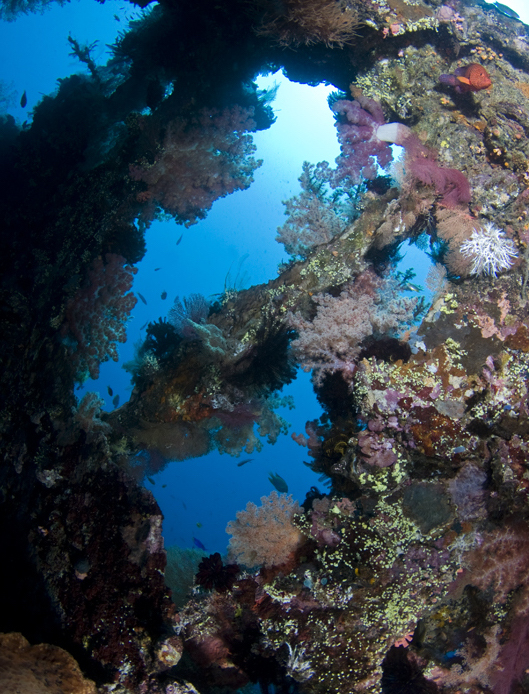 The wreck of the Liberty remains below the surface where it has become one of the most dived sites around Bali. Due to its proximity to the beach and shallow depth, the USAT Liberty wreck is an easy shore dive—and a popular one. Each morning during the high season, divers will gather at entry points along the beach and at a nearby carpark, suiting up and getting ready to plunge. Shore entry is made from the black pebble beach. Incoming waves are usually minimal but can pose difficulties for entry during the monsoon season, as you are thrashed around while trying to don your fins. The wreck is an impressive dive site for many reasons. Its sheer size of 120 meters (393 feet) is enough to keep divers busy over multiple dives. Numerous holes in the structure of the ship provide plenty of opportunity for exploration with many swim-through locations. The inclination of the wreck—currently it lies on a slope with depths ranging from 5 to 28 meters (13 to 91 feet)—makes it great for multilevel diving. Lying parallel to the shore, the shallow end of the wreck is accessible to both snorkelers and open water divers, while more advanced divers can start all the way to the bottom and make their way up through the dive. Being underwater for so long, the wreck has had plenty of time to develop into an artificial reef ecosystem. Much of the exterior and interior is now encrusted with hard and soft corals, attracting a variety of fish and macro creatures. Divers can expect to be greeted upon arrival at the wreck by surgeonfish, napoleon wrasse and bumphead parrotfish. Barracudas, trevallies and fusiliers are also commonly spotted milling about. The wreck itself is also home to many kinds of smaller reef fish and colorful nudibranchs. There are ample opportunities for wide-angle and macro photography and underwater photographers might want to consider multiple dives using different lenses to capture a variety of different shots. Diving in Bali is possible all year round but the best time is between May and October, when the visibility is high and the seas calm. The best time to dive is at sunrise, when the morning sun is shining and you may be lucky to get the wreck to yourself. After that, diver traffic becomes considerable and you will be forced to share the experience with other diver groups. Night dives are also an attractive option, but make sure you are with a guide who knows where they are going. Tulamben is a three-hour drive north of Denpasar airport. You can get there by taking a local bus or hiring a car from a private company. 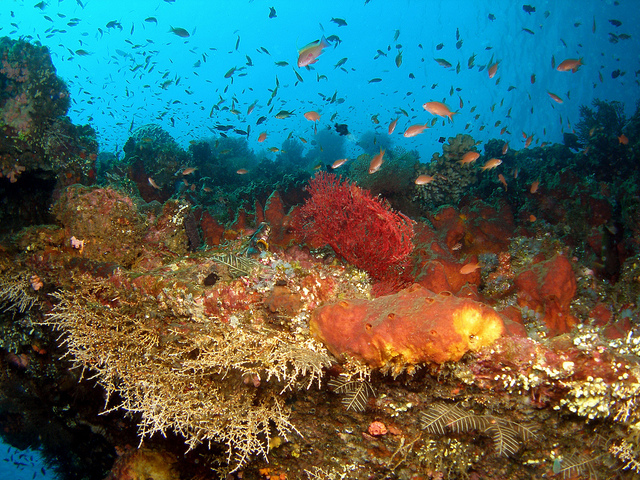 There are several dive resorts in the Tulamben area. Liberty Dive Resort, Puri Madha Dive Resort, and Ocean View Tulamben are located no more than a two-minute walk from the beach entry point. Alternatively, resorts and dive centers throughout the island offer day trips to Tulamben. Dive Concepts, located in Tulamben, offers a pickup service for interested divers staying in Kuta, Sanur, Seminyak, Ubud and other locations in south Bali.